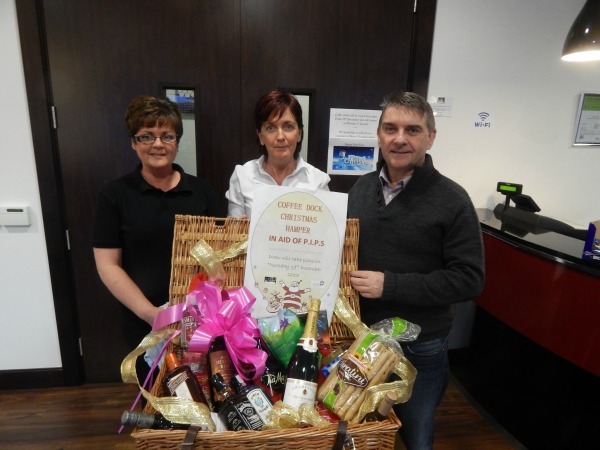 The Coffee Dock in Carnbane Business Centre, Newry, held their annual Christmas Hamper Raffle on Thursday 19 December, this year they selected PIPS Newry & Mourne to benefit from the raffle, proprietor Pauline Hadden and Ann Hadden presented Seamus McCabe from PIPS Newry & Mourne with £203.00 the proceeds from the raffle. The winner of the Raffle was Mr Owen Magill, Newry. The Coffee Dock and PIPS Newry & Mourne would like to thank everyone who bought tickets and supported the raffle.